New video posted of the pups at 6½ weeks old. Little terrors are getting ready for their new homes. As the video shows, now full of mischief and teeth sharpened to razor blades! Couple of new videos posted as the pups venture outside for the first time! As usual though, after the initial shock and 15 minutes winge ….they love it and investigate for another 10 minutes and then fall asleep! Morocco’s pups are over 4 weeks old now and developing characters fast. Latest video here. This video is a rather amusing play fight as they develop their personalities….so cute! Morocco’s pups are now over 3 weeks old and all growing well. Weights are all well over 2kg now. New video has been posted of the pups eating the raw meat. Morocco’s pups are 2 weeks old today and all are already well over 1.2kg in weight. We have added photos and the 1st video of Morocco’s litter. All the pups are thriving, they are all rather big from birth; 550g to 670g birth weights!! Even more remarkable is that Morocco had 13 pups so did really well not only to carry them all but also considering their huge size! Many thanks to all who have sent warm words regarding Finland, he was obviously well loved and thought of outside of Leonmoor. We have lost our most iconic dog; Finland. His lion-like looks and huge paws inspired many to want to own a Leonberger because he truly looked like a lion. Extermely loving and loyal to his family, you were honoured if he came up to you for a fuss… and if he did it made your day! One of the most prolific studs in the Leonberger world, he sired many beautiful offspring all inheriting a small part of his uniqueness. We have put together a photo tribute to our lovely boy whose presence is greatly missed in our family. Rest in peace our gorgeous boy. Some happier news; Morocco has given birth to her pups and all are currently doing very well .We already have reservations in place for all but 2 of the pups so if you are interested in owning of these gorgeous puppies please contact us asap. Happy Birthday Lightning you have reached the grand old age of 12 years!! Marvellous age for a Leonberger, and still as bubbly as ever! You are a credit to the Leonberger world and to your breeders; Jane and Tony Wilson, of Jantonely. Yet another wonderful example of the offspring of Caspar, bless his soul. Alll of the pups from Cairo and Malta have gone to their new homes; a fantastic collection day tinged with sadness as they leave us to go to their new lives with their new families. Some more great news; Morocco is pregnant and due to give birth in a couple of weeks time! The father is Brazil. She has been scanned with 9/10 and 5 of them have been reserved already so if you are interested in one of her beautiful pups then please contact us ASAP. Pups are rather huge now! Full of life and energy and now complain when we bring them in for the evening! New videos posted for both Cairo and Maltas pups. All have had their final 3rd worming session. Pups are flying now, weights between 3.5kg and 5kg, and noisy as hell! Had their first excursion to the great outdoors, more to follow. After some technical hitches have finally managed to upload video 3 for both Cairo and Malta pups! All motoring along now growing 150-250g per day, eating for England and us out of house and home! Hope everyone had a good Xmas, a slightly different one at Leonmoor as you can imagine! All pups growing well now, weights ranging from 2kg up to 3kg depending upon their birth weight. All regularly eating the raw meat now and gradually weaning them off mums. Only 2 girls remaining to be reserved now, so if interested in a puppy then please contact us asap! Pups all doing well and growing fast now around 70-100g per day. Had their first solid mince meal and we videoed this for both Cairo and Malta pups…. Feeding frenzy with Cairo’s lot, much more relaxed with Malta’s lot! Mum and pups are all growing well. You can see the videos of the puppies from both Cairo and Malta by clicking on the respective links on the home page. We only have 4 girls remaining to be reserved so if interested in one of these beauties from Cairo then please contact us ASAP. The girls have all given birth to their pups! Mums and puppies are all doing well. Vienna only had one pup so we are keeping her. Half of the puppies are already reserved so if you are interested in one of these beautiful puppies then please contact us ASAP and note that only females are now available! Just a couple of weeks to go before the birth of the puppies! Getting rather excited now as the girls are really ‘showing’. Great news; Malta, Cairo and Vienna are all pregnant! The proud stud is Brazil, our rather impressive boy from Belgium. All those that have contacted us for a puppy over the past year please ring ASAP to confirm your interest in a puppy from either of these beautiful girls. Our gorgeous and mischievous Africa has reached the grand old age of 11 years! Full of character and has a word to say about everything, we have kept her busy for the past 4 months as she has nurtured our new addition Tundra into the ways of the world. Always a brilliant mum, she has mothered Tundra in her early years beautifully, and considering their age differences, still has the energy to play with her regularly! Some sad news as well unfortunately; our adorable Korea has passed away. She was 9½ years old and was full of life and bounce right up to the moment she left us. Very smart and loving, a bit of a ‘daddy’s’ girl, her enthusiasm for life is already being sadly missed. She has left behind some cracking offspring, and we luckily have Chile and Malta here to remind us of her every day as they both have big chunks of her personality and traits. Thank you for some wonderful memories Korea. HAPPY BIRTHDAY FINLAND! 11 years old today. Also we have been contacted by many of his siblings….who have also reached this momentous age…..Happy Birthday to all; Roxy, Siberia, and Whisky! Food for thought…. under the current “health” test regime for Leonbergers Finland and all of his 11 year old siblings would not be here. Both their mum and dad would have failed the health tests! How ridiculous is that? One of the longest lived litters with least amount of health problems would not have existed! “Health” tests should be revisited because all they are doing is reducing our gene pool to dangerous low levels, forcing many breeders to give up breeding as it is too difficult and far too much hassle and worry (approx 1 in 5 dogs will fail the tests!! ), making new diseases “appear” such as LEMP that were not a problem before but of course are now as we have had to breed with dogs that had it but we did not know. These tests do not make our breed overall healthier…. they just concentrate on eradicating the diseases that are known about. If we were considered a native species we would now be considered a “vulnerable” breed as the number of puppies born each year has now dropped below the 300 per year mark in 2017 and looking worse for 2018. The first time for over 15 years where the average births per year has done this. The only people who benefit from these disease tests (should not be called health tests) are the vets and BVA who do the testing. Once these tests are introduced you can NEVER get them changed or removed even though no longer necessary. An example is the hereditary cataract eye test; we have to test every 12 months at a cost of £50. Even though less than 5% of Leonbergers show hereditary cataract issues after they have passed the 1st test! But vets/BVA livelyhoods and profits depend on these tests so they won’t be changed. What a marvellous conflict of interest that everybody ignores. The hip/elbow average scores have not changed in 20 years, and yet we still have to test them….even though mounting evidence points to 1st year development the primary cause of hip/elbow dysplasia and NOT hereditary….but it won’t be changed as the BVA makes literally millions of pounds every year on these tests for all breeds. After the LPN1 was discovered, did these research people all go home and change jobs? Of course not, they had to remain employed and therefore they had to find them something else to do….. find LPN2 or a LEMP but as you see the research HAS to continue and in the meantime each new test destroys our breed further. When does it stop? When there are so few Leonberger breeders remaining that they forget the tests just to keep the breed alive because you can guarantee that every Leonberger would fail one test….. Some of these tests have just not yet been discovered. A final note to all those people who like to spout on about “responsible” breeding….ie. doing all these tests and calling on even more to be implemented to apparently improve the health of the breed…...at which point will there be any Leonbergers left to test? 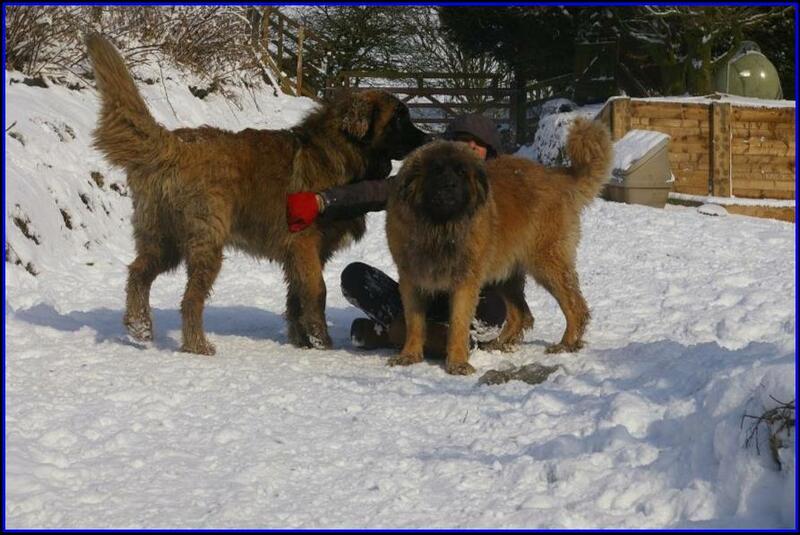 Or any Leonberger remaining that will pass all the tests? ...and there will be more tests needed because “new” diseases will sadly becoming more prevalent as the gene pool shrinks….. Sadly and inevitability the people who naively think they are doing this for the good of the breed will eventually lead to this wonderful breeds virtual extinction. Anyway, off the soap box for now, and just extremely glad that we did breed from our beautiful Alaska and the gorgeous Caspar to produce these amazing long lived dogs :-) Happy Birthday Finland and siblings! Unfortunately, both girls are not pregnant. One of our offspring, Thunder, got his picture on the front page of local newspaper recently. It was part of a fund raising campaign for a disabled riding school and he looked so gorgeous they decided he was going on the front page! Well done Thunder and his owners! We have a new addition to our family, Tundra, a gorgeous little puppy girl who has joined us from Bergleeson. Thanks Ann & Frank, she is a beauty! We have had 2 matings! Malta and Morocco have been mated, anyone interested in a pup from either of these two beauties then please contact us ASAP. This includes all those that have expressed an interest in the past year for a pup, we just need you to reaffirm your interest. Well most of experienced the cold Siberian storm the ‘Beast from the East’ in some shape or form. We thought we would share our pictures/videos of our experiences on the farm which were rather extreme to say the least! Needless to say the dogs loved the abundance of snow! 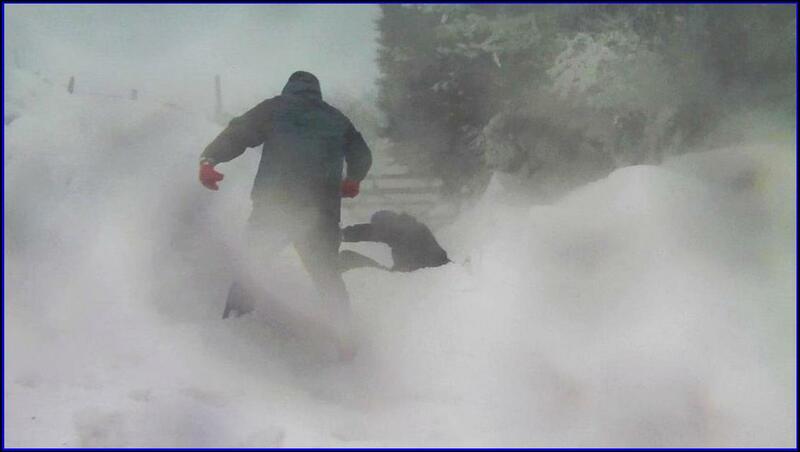 Video of us struggling up the driveway over the snow drift to the gate. Without the kindly removal of the snow by a rather large digger from a Lancashire County Council driver we would still literally be snowed in under 15-20 tons of snow drift on our driveway with no way of moving it except via a shovel and days of hard graft. Our gorgeous Lightning has reached the grand old age of 11 years old today! Such an easy going lovable girl that absolutely loves….food! This is her great passion in life and long may it continue. Just a quick note to say Happy Xmas and New Year to everybody! With a bit of luck 2018 will be a bit more successful on the breeding front for us. 2017 brought a fair share of sadness losing China and then Thunder. On the positive side we gained Brazil who is a stunning boy and will be fascinating to see him develop into adulthood in the new year. We are planning to mate Malta, Vienna and Morocco so fingers crossed we get some puppies for 2018. We have some very sad news; our adorable Thunder has passed away. He died suddenly soon after feeding a week back and left us shocked that our so lively and active boy could suddenly leave us with no warning, even though he was 11 years and 4 months old. He was such a character in our home, full of passion for a cuddle and always on the go. Would always get up to greet you when you entered a room regardless of his age. It was virtually impossible to go past him without him pressing his head in your crotch for a fuss and cuddle, so adorable. A minute later you were allowed to pass! He has experienced many a mountain walk in his varied life, climbing many Munro’s in Scotland (over 3000 feet high) in both summer and winter conditions. Incredibly agile, he could scale a grade 2 scramble unaided and was simply indestructible. We honestly thought our gorgeous boy was going to reach his 13 or 14 birthday such was his fitness, but it was not meant to be. We still cannot believe he is gone. Probably the most confident dog we have ever owned; we never found out what phased or disturbed him, because whatever the situation of going onto a packed bus for the first time, or descending a steep rockface, he reacted calmly as though he had been doing it his entire life! Our other golden oldies Finland, Lightning, Korea and Africa were very subdued for days afterwards …. Thunder of course has always been there from the day they were born, like a constant North star...and now he has gone. Rest in peace Thunder, you were an exceptional Leonberger and we were very proud and honoured to have lived with you for all those years. On a happier note, but rather subdued due to Thunder’s passing, we have celebrated Africa reaching her 10th birthday. Happy Birthday Africa, our cutest Leonberger by far. Happy 10th birthday to Finland and all of his litter mates! Our magnificent boy reaches the magical 10 years old and still jumping around like a kid! His beautiful mum, Alaska, would be so proud. It was Alaska’s demise to osteosarcoma at 6 years old that prompted us to research and then move all of our dogs onto a raw prey meat diet …. and what a difference. All of dogs are now reaching ripe old ages and free of major disease and illness on the way, best decision we ever made. We are delighted to announce the arrival of our new addition to the Leonmoor clan our gorgeous 15 week old boy, Brazil. We travelled over to Belgium to collect the little chap at the weekend, and what a stunner he is. So well behaved and calm, not one peep of complaint during the entire 500 mile journey home! We stayed at a hotel with him for one night just before this journey and he did not cry or complain all night, and did not even have a toilet mistake. Considering we had just met him what an amazing and confident boy, incredible! Such a wonderful testament and endorsement to his breeder, Nancy Spinnael. Thank you Nancy for such a cracking boy. It took about 20 mins at the South Mimms M25 services to get to a seat such was the attention he generated and the coaxing and questions you inevitably get with a Leonberger puppy in a public place. The only embarrassing moment was when he decided to bark at us whilst we had just started eating while on the outside patio at the services …. he wouldn't shut up lol ! So after rapidly downing our meal, apologising to those sitting next to us, trying to coax him to be quiet, with him staring at us and barking constantly, we made a hasty retreat to the car after enjoying a nice relaxing meal…... He then immediately settled into his cage, fell asleep, ready for the next part of the journey! He was probably telling us to hurry up. The first thing you notice and hear about Brazil is his feet ….. He stomps around with these enormous great feet! You can hear him coming from miles away! So endearing. Our young girls Vienna, Malta and Morocco already have fallen in love with him and exhaust him most days with him chasing after them. Our gorgeous boy, Thunder, is 11 years old today! He is still fit as a fiddle, no sign of arthritis or lack of strength in his back legs as the front photo shows. Still bullying the girls out of their bones, and generally being Thunder …. absolutely adorable! We have just had Chile & Bronte scanned and sadly neither of them are pregnant. Sorry to disappoint all those waiting for our pups. We have re-organised our Home Page Galleries section. Our son Bradley has taken so many great photos of the dogs lately that we have had to accommodate more space on the website to show them! They are some truly beautiful shots to look at. We have had a successful mating of Chile and Bruges, and Bronte and Bruges. We shall know in 4 weeks time if they are in pup. We have posted 2 new videos of our dogs; Bronte getting a back massage and the dogs enthusiasm at feeding time! Our former house is for sale! Anybody who is interested please follow the link to Keenans estate agents for more details. Our dogs were struck down with a mystery virus last week, all 14 came down with bad sickness for a couple of days, vomiting water and mucus still after a couple of days, and then followed by a bout of diarrhoea 2-3 days later. We have never experienced all of our dogs getting the same thing so quickly, and were worried with our oldies, especially with Thunder being close to eleven years old. Thankfully it has passed, and all have recovered. Our Lightning is 10 years old today!! Our beautiful girl has reached the milestone for Leonbergers that we wish all could make. She is still exceptionally lively, flirting with Bruges the other day, jumping around him…… still a floozy at 10 !! She is remarkably healthy with no arthritis in her joints, no problems getting up, so pleasing to see. It is with great sadness that we have had to say goodbye to our beloved Storm and China. Storm left us at the ripe old age of 10 years and 6 months, China was 9 years and 6 months. It was a very sad end to 2016 for us. We shall be making a memorial photo album for each soon to celebrate their lives with us. We have been rather amiss with updates to the site, so much has been going on it has been difficult to sit down and find the time or inclination. We and other Leo breeders do not seem to have had a particularly happy or successful 2016, with many losing puppies and some losing complete litters. On analysis the culprit on many occasions appears to be Canine Herpes Virus that is rearing its ugly head. A virus that is common amongst the dog world in general, with up 40-50% all carrying the virus. It only becomes active during low immunity periods in the mother, or during periods of raised stress or anxiety. Although harmless to adult dogs, it is lethal to unborn and newborn puppies, causing many failed matings, miscarriages, stillbirths and fading puppy deaths. Puppies up to 3 weeks old are vulnerable, and if they get it there is nothing you can do to save them. Just to be clear, adult dogs have nothing to fear, it is only unborn and newborn pups that are vulnerable. Our Malta is growing up fast, just weighed in at the vets at 44kg at exactly 6 months old! We have updated all of the photos for Our Dogs section, with new pictures for each of our dogs at our new home. New and last videos of pups before collection day. These videos were taken from our survellience IP camera so we were not there to influence behaviour! All of Canada’s and Mali’s pups are now reserved, only a couple of weeks to go before the big collection day. New video posted of the pups at 6 weeks old. New videos posted of the pups. Apologies to those trying to contact us via the info@leonmoor.co.uk email address. We have had technical difficulties without realising it, so emails were not getting through to us so apologies if you thought we were ignoring you!. We have now resolved the situation and normal service resumed but we have not recovered the lost emails. Both sets of pups are now growing fast on the raw meat. Glad to say after all the trauma of the past 4 weeks things have settled down to a more ‘normal’ state. We have put both litters together now which helps develop better socialisation skills for Mali’s litter. We have posted a new video of the pups together running around the dog annex kitchen area. This is the fun time, their personalities emerge, they are now small dogs full of mischief! A big thank you to all those offering sympathy and support after Mali passed away, it was greatly appreciated. It is with great sadness that we have to announce that our beautiful Mali has died after contracting a severe infection from the C-section after the birth of her pups. The infection was passed onto several of her pups who also passed away leaving us with three from the original eight that were born. We have had to hand rear the remaining three pups and it is so sad that they will never know their wonderful mum. She gave birth naturally to 7 of her pups, one unfortunately got stuck high up in her womb, died and caused the infection. She had 3 operations over 8 days to save her, one of which lasted 5 hours, but all to no avail. She was an extremely sweet natured and good humoured girl who’s passing has left us saddened and in shock that you can lose your dog so quickly and unexpectedly. Rest in peace our lovely girl, we shall be keeping one of your pups to keep your wonderful and vibrant personality with us. We have posted new videos of Mali’s and Canada’s pups. Canada’s pups have been introduced to raw meat new video posted. New videos of the pups posted. Mali’s pups have been introduced to chicken & tripe mince for the first time and this is shown on the video. We only have one pup remaining to be reserved from Canada’s litter, so anyone interested please contact us asap. The pups go to new homes early to mid July. We have posted new pictures and videos of the litters at 2 weeks old; just click on the links on the Home page. Mali’s litter are all reserved, all those interested in a pup from Canada’s litter please contact us asap on 01282 424001. Our wonderful old timer siblings, Thunder & Storm, have reached the magical age of 10 years old !! Thunder is still a youngster at heart, managing to climb over a 4ft fence the other day to follow Bruges on his travels to find one of our girls who are in season!! We now have a new guestbook message centre where you can leave your messages regarding our website or your Leo/pup. Unfortunately our other guestbook provider suddenly stopped operating without any warning and we lost all of the previous messages. Mali and Canada have both given birth to their pups ! Mums and pups both doing well. Bruges is the father to both. Over half of each litter are already reserved so anyone who is interested in a pup from either of these two beautiful girls then please contact us ASAP to avoid disappointment. Great news for all those waiting for a pup from us, Mali and Canada are pregnant! Big Bruges is the dad. We shall be contacting all those who expressed an interest in a pup in the coming days, but if you want to reaffirm beforehand your interest please ring us asap. Apologies for all those trying to contact us on the old telephone number, but we have moved and have been waiting for BT to connect us. We finally have internet and a new telephone number 01282 424001. We have moved to a farm in Briercliffe, near Burnley; something we have dreamed of for many years and have finally managed to make the move. The dogs have just under an acre to roam, and we have a dedicated ‘dog’ annex connected to the main farmhouse for home boarding, doggy day care and litters. All set in the picturesque pennine rolling landscape, and yet only a few miles from Burnley town centre. The area is very popular walking country with the Pennine Way, which originally was intended to pass through Briercliffe, only a short distance away in West Yorkshire. The Burnley Way, the Bronte Way and the Shuttle Way all have routes through the parish. The dogs love it! Already running like maniacs through the bushes, shrubs and biting off the heads of all the lovely daffodils! Grrrrr. It is so sad that we have to announce the passing away of Brutus. He was the last surviving puppy from our very first litter which was India’s first litter. He was aged 11 years and 8 months and passed away peacefully last week. He had a very active life of 2 moorland walks every day for his entire life right up to his passing. He had his mum’s strong character and good looks, and every time we saw him he reminded us of our beautiful foundation girl. He lived next door to us throughout his life so we met with him regularly and were privileged to share his life. Our condolences to his family who should be proud of their big boy and the great life they gave him. Pups are now 7 weeks old and are running around like speedy Gonzalez’s! They go to their new homes soon; some very excited owners in the waiting. Weights are now between the 6.5kg and 8.5kg mark. Last 2 videos posted at 7 weeks old. Pups are now 6 weeks old and thriving! Weights are around the 5-7kg mark. New video posted at 6 weeks old; they are sharing a rather large bone! Pups are now over 5 weeks old, and are already hardened outside veterans! New videos posted of them outside. Pups are now registered with the KC and the theme of this litter is famous pirates! Very appropriate for some of the little scoundrels! Pups are now 4 weeks old and had their first excursion to the great outdoors yesterday! Took to it like ducks to water; they had a sniff around, had some dinner, then fell asleep under the shelter! Weights are around the 3-4 kg mark. Pups are now 3 weeks old and onto the raw meat as well as still feeding on mum. Staggering around, eyes open, and into the ‘screaming for no good reason other than I can!’ stage. Characters are already developing, the difference between them all is already apparent. Finland as usual always tries to have a peek at the new arrivals, he has always been fascinated by the young pups and still gets excited when they are born! The pups are now 2 weeks old and thriving. Korea has been simply exceptional; so calm and assured and keeping them spotless. The pups are around the 1kg mark now, most doubled their weight in the first 10 days which is the usual good indicator of a mum producing good milk and the pups suckling well. At this stage this has been one of our quietest litters! Long may it continue! Korea has given birth to 8 gorgeous pups! All are doing well and as usual Korea is being a great mum. All of her pups are reserved; sorry to disappoint many people who wanted a pup, our next litter will be probably be around the April/May time. Just a couple of weeks to go before the big day of Korea’s pups birth! Lots of snow at ours today, so took Chile and Bruges out for a walk in it … there first experience and of course being Leo’s they loved it! We are pleased to announce that Korea is pregnant! Her pups are due in 5 weeks time and will go to new homes mid to late March 2016! All those interested in a pup from this Bruges and Korea mating then please contact us ASAP. This is Bruges first time as a stud so we are all rather excited! We have had a mating between our gorgeous Canada and the impressive Bruin. We have also mated our lovely Korea with our big boy Bruges. This is his first stud duty since we imported him from the Netherlands! We already have a puppy list in place so if you are interested in this lovely mating then please contact asap. We had a great time last month on a day walk with some of our Leo friends and offspring. We went to the Darwin tower on a glorious September sunny day. Luckily, there is a dog friendly café at the end for a nice cup of tea and slice and cake! We are very sad to announce the passing away of our beautiful and most loyal girl, Austria. She was taken from us very suddenly over 2 days with a mystery virus that caused extreme diarrhea and vomiting and she could not be saved. The speed of her demise was very upsetting and we still cannot believe she is no longer with us. An exceptionally loyal and protective girl, she was devoted to her family and would not have allowed any harm to come to us. She was only interested in us, and though polite to visitors and strangers she would keep an eye on them during the visit to make sure no shenanigans went on! Incredibly healthy and fit throughout her life without one visit to the vet for an illness, it made it even the more shocking with her passing. Rest in peace our lovely Austria, we shall cherish all the great memories you gave us. Happy birthday to magnificent Brutus who is 11 years old today!! Brutus, needless to say, is fed a raw prey meat diet and is still goes for his two walks on the moors each day. He is in excellent health and still manages the odd trot after the postman! We are privileged to see Brutus regularly on the moors, and his looks and attributes bring a tear to the eye as he reminds us so much of India. With the ‘heat’ of summer almost upon us we thought we would cool you down with a home page snowy picture of the Monadaliths in Scotland during one of the winter walks a few years ago! Our raw prey diet MoreRaw website is doing well with a growing regular customer list. We are currently trying to source home range chicken carcasses that we shall be incorporating into the food hampers soon. The house is now very quiet; all the pups have gone and everything has returned to relative ‘calm’ with only our 14 Leos remaining! We are very pleased to announce that through our sister website, www.moreraw.co.uk, we can now offer a raw prey meat diet that will provide all the necessary nutrients necessary to keep your dog healthy and fit and make your puppy reach its full growth potential. This is the diet that we feed our own 14 Leos, and anyone who has visited us will know, they are very big, healthy, fit and active dogs with our 9 year old’s behaving like 4 year olds! No longer do you have to worry whether you are feeding the correct balance of meats to obtain the necessary nutrients, we provide a complete diet for a set time for your dog or puppy for optimum growth and health and to keep those joints supple and strong. All of Mali’s pups have gone to their new homes. Just one girl from Cuba that goes to her new home in a couple of days, the house is eerily quiet even with our remaining 14 dogs! All of Cuba’s pups are now reserved. We have no puppies now available. We now have only one girl remaining to be reserved for Cuba’s litter. The pups go to their new homes at the beginning of May. All of Cuba’s pups are growing amazing and are all over 10kg now. New photos and video of Cuba’s litter have been uploaded please follow the link. We only have 2 girls remaining to be reserved from Cuba’s litter. If you are interested then please contact us asap to avoid disappointment. They will be ready for collection early May 2015. All of Mali’s pups are now reserved. Mali’s pups now weigh in at exactly 6 weeks old between 7.8kg and 9.5kg….massive! Bruin, the father of Mali’s litter came to visit the other day, and what a magnificient boy he is! Only one girl remaining to be reserved from Mali’s litter. If you interested then please contact us asap. Mali’s pups are growing very well, and getting increasingly noisy in the morning now anxious to be let out to play! Very noisy in fact! Cuba’s pups continue to grow more massive by the day. We are now taking reservations for her pups, anyone interested please contact us. Cuba has given birth to 4 pups and they are all growing well. They were born huge, all over 900g weight! Mali’s pups are eating raw meat by the ton! Only a couple of pups remaining from Mali’s litter now so if you are interested in reserving one of them please contact asap on 01706 220292. Pups have been wormed and now all around the 1.5 to 1.8kg mark. They are now eating 5 small meals of raw meat a day supplemented with mums milk. Chile is growing huge; she is currently the same height as her mum, Korea, towers over Africa and all at exactly 6 months old! Mali and pups are doing great, all pups are over 1kg in weight now and very very thrifty! Mali is currently eating approximately 4kg of raw meat a day now to feed her pups, an impressive quantity! All those interested in one of her beauties then please contact us ASAP! Cuba is due to give birth soon so full of anticipation and excitement for our big girls first litter! Mali has given birth to 9 pups, all doing well !! All of them were over 600g birth weight which is amazing considering there are 9 of them. Mali has taken to motherhood like a duck to water, she is fantastic. Hope everyone has had a good start to 2015. We have some great news in that both Mali and Cuba are pregnant. It will be their first litters, so its all very exciting! Mali was mated with Bruin; a big, strong really impressive male originating from Belgium owned by Anne and Francis Dutton. Cuba was mated with Thunder. This will be Thunder’s last stud duty, which at nearly 9 years old shows his amazing virility and fitness. We have not told him yet…. he still runs around like a 6 year old! We took advantage of the snow today to take some new photos because as we all know a Leonberger looks it best in the snow! Bruges, our Netherlands import, is growing huge, currently around the 60kg+ mark at 8½ months old. Soft and dependable, a real credit to the breed from Europe. Anyone interested in owning a pup from either Cuba or Mali please contact us asap as we already have a reservation list in place. Stevie has now gone to his new home. Thanks to all that contacted us regarding him , really is heart warming the number of people prepared to give him a good home. Literally ½ hour after posting on the website his new owners phoned us and came and visited us to see him and of course fell for his charms! 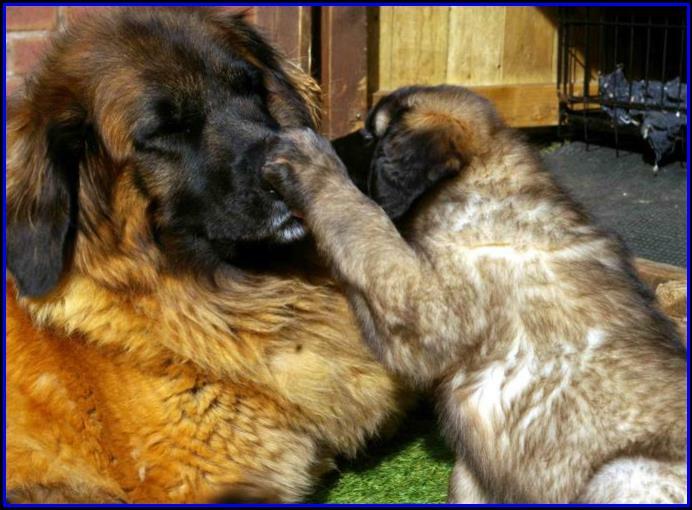 We are looking for a very special family home that can give an 11 week old blind Leonberger puppy a good life. We have called him Stevie. He sadly suffered from an eye infection from birth that is virtually impossible to prevent blindness as the eyes are not open and the infection damages the eyes beyond repair. He is in good health otherwise and is a very sociable, loving, adorable boy that is full of mischief that you would expect from a Leo pup. If you think you can give him a great home life then please think carefully about the commitment and dedication required and if still interested then please ring us to discuss matters and then potentially set up a visit for you to meet him. He would ideally be suited to a life with other dogs, kids, and generally lots of human company as he thrives in this environment. We unexpectedly have a 9 week old female pup available from China’s litter, if you are interested in this beautiful girl then please contact us ASAP. We took Bruges to the LCGB show on Sunday mainly for a bit of socialising, had a good day out, and was pleasantly surprised that he was placed third in Minor Puppy class so has qualified for Crufts in March! Bruges handled the day superbly, such a beautifully balanced young chap. All of the pups have flown the nest and are settling nicely at their new homes. We have kept one of Korea’s beautiful little girls, and we are calling her Chile. She is a rather large girl already 10kg at 8 weeks! All of China’s and Korea’s pups are now reserved. Not long now as collection day for the puppies looms very close! All have been microchipped and have had their final worming session. Two new funny videos posted; ‘Bringing the pups in at night’ … and …. ‘Pups playing with the new tube’ .. We gave them a new toy in the garden-great fun! New video posted of China & Korea pups and a couple of new pictures. Pups are now 5 weeks old and we have added some new pictures. They are doing great and full of mischief. After a week outside, they are not happy bunnies being brought in at night! Crying the house down until they settle ready for the morning…..which brings fresh screaming to be let outside again! We are very excited to announce the arrival at Leonmoor of Bruges. (I’m Big-Bos V.H. Leonhuuske at Leonmoor) He has been imported from the Netherlands and has been with us a month now and has settled in famously. A stunning boy, superb temperament and huge feet! He is already 43kg at 5½months old. He is so laid back and calm he is a wonderful juxtaposition to our mad girls!! Our huge thanks to Bert and Meike Elshof, his breeders, for allowing us to have one of their beautiful puppies and especially for doing such a wonderful job of bringing him up for his first 4 months before he could be imported. We followed his many adventures online before he arrived; river swimming, shopping at the supermarket, dog shows, local playground with the kids, and numerous field walks! All the pups are doing well, and have now had their 2nd worming session at 4 weeks old. Taking advantage of the sunshine, they have now ventured outside and after the initial screeching of ‘what the hell is this!’ they have settled down to enjoying the new freedom the great outdoors has to offer! Only one girl remains to be reserved from Korea and Finland’s litter, so if you are interested then please contact us ASAP to avoid disappointment. Pups are now being fed raw meat and have had their first worming session. We have posted the first videos of the litters at 2 weeks old so click on the links on the home page to pick either China or Korea. We only have a few remaining pups to be reserved so please do contact us ASAP to avoid disappointment. The pups are growing well, and now freely staggering around the pen in search of mum for food! Both China and Korea have had their pups and all are now doing well. China has 5 pups and Korea has 8. Please contact us ASAP if you are interested in one of these little beauties. We are very sad to announce that Ozzie, aged 10 years 1 month, has passed away. He was a very special boy from our very first litter from India, and we have followed his life with interest through his owner Bev and her family. He was 6th born (and so gorgeous!) and is the last but one that we know that are still living from our foundation litter. He was very similar in character and looks to his wonderful mum, India. Our condolences go to Bev and family, who are terribly missing their boy, but they can reflect that they gave him a long, varied and wonderful life. Very wisely Bev fed him a raw meat diet from very early in his life and we would like to think this has contributed to his long life and lack of vet visitations. RIP the lovely Ozzie, you are already sorely missed. The Northern Leo Ramblers meet up this Sunday 31st August 2014 at @12pm at Morrison’s car park at West Kirby, Wirral CH48 0QA. From here a dog friendly walk and then a dog friendly pub/café at the end . We cannot unfortunately make this date as it is too close to the birth of our litters that are due, but it will be great fun, all Leo owners are welcome, try and make it! Next event coming up is the Northern Leonberger Fun Day Sunday 7th Sept 2014 @11am onwards; being held at Moorlands Village Hall, School Road, Bagnall. Staffordshire Moorlands. ST9 9JP. Great news! Both our lovely girls, Korea and China and pregnant! Both have been scanned with 8 pups. We already have reservations in place, so if you interested in owning a puppy from either of these beautiful girls then please contact us ASAP to avoid disappointment. Click on the titles to be taken to the website for more information about what events are happening on these fun days..
All are welcome to attend, take you Leo along to enjoy the fun! We are pleased to announce that we have had a mating of China and Thunder, and of Korea and Finland. All those interested in owning a puppy from either of these lovely matings then please contact us asap on 01706 220292. The definition of chaos prevails in the Leonmoor household at the moment as we have 8 girls all in season at the same time!! The boys are beside themselves and the girls are all taking turns in mounting each other! All very amusing and maniac! The pups have had their 6 week worming session, all growing rather large now! They have been registered with the Kennel Club with the theme for this litter being TV series; Dexter, Breaking Bad, Silk, Prison Break, Heroes, House of Cards, Life on Mars, Homeland. New videos and pictures for the litter here. Not long to go now before they all go to their new homes! The remaining girl puppy is now reserved. We unexpectedly have a girl puppy available from this litter. Please ring us ASAP if you are interested in having one of these gorgeous puppies. Pups are now 4 weeks old and growing big! Had their second worming. Many more videos and pictures can now be found here, including their first day outside! We have had our mandatory Kennel Club Accredited Breeder inspection and that went well. We mentioned a month or so ago that the new requirement to be legible to be included in the scheme you must be inspected every 3 years. Anyone investigating getting a puppy from a breeder claiming KC Accredited status we would strongly advise checking that they are currently registered and have been inspected otherwise they cannot display the KC logo. Pups are growing well now and are 3 weeks old. Already eating the raw meat with enthusiasm! They will be introduced to the outside world play area in the next couple of weeks and it is there that their development really takes off and blooms. New photos and video of them at 3 weeks old view here. Africa has given birth to 8 pups! All are doing well. Africa as usual is proving to be an exceptional mum, calm and reassuring and caring. She is a credit to motherhood! We are pleased to announce that Africa is pregnant! All those people who have visited us and expressed an interest in one of Africa’s pups please contact us asap to reaffirm your interest. Hope everyone had a good Xmas and a good start to 2014. We have had a successful mating with Africa & Finland! We shall know if she is pregnant in a couple of weeks time. If you are interested in a puppy from this potential litter then please contact us asap as the waiting list is growing fast. The Kennel Club have made substantial changes to their Assured Breeder Scheme. As from January 1st 2014 no litter can be registered as being from an Assured Breeder until that breeder has had a physical inspection from the Kennel Club. The Kennel Club has also taken the step of being overseen by the UKAS accredited certification body, a recognised organisation known for its thoroughness in maintaining auditing standards. In addition all Assured Breeders will be required to have a physical inspection every three years. These are major changes to the scheme and has transformed it overnight from a weak, nice idea scheme into a serious system to increase standards in puppy rearing and welfare. Critics of the Assured Breeders Scheme quite rightly complained that people could join it without ever having been inspected or their paperwork, service or standards being checked. Not anymore. We welcome these changes as a positive step forward in helping people find breeders who do follow good standards for their puppies. All of Austria’s pups have gone to their new homes, what a great Xmas their families are going to have with such beautiful new additions. Life will never be the same again! It is with great sadness that we have to announce the passing away of Alfie. He was the beautiful boy who features in our Dog Insurance article written in 2011. He was a wonderful and exuberant character who will be sadly missed by all, especially his devoted owners Derek & Jo who gave him a great life and should be justly proud of their special boy. We have now moved all of Austria’s litter 3 videos and pictures to Leo Information under Our Litters, so if you would like to view in the future please follow the links. We would like to wish everyone a lovely Xmas and don’t forget to give your dogs a special hug on Xmas Day. Pups are now over 6 weeks old and all growing really well. They have just had their last worming dose. All are around the 6kg mark. We have updated the pictures and videos for them at 6 weeks old. Pups are 5 weeks old today and had their first excursion into the big outside world. Their first video outside can be viewed here. Getting big and boisterous now and full of mischief! Pups are now over 4 weeks old and have had their 2nd worming. They all weigh around the 4kg mark and are almost ready for the big outside world. We have two new videos of them. Pups are coming up to 3 weeks old tomorrow and growing very well. Weights vary between 2.2kg and 2.8kg. They have had several meat meals now so the pressure begins to slowly come off Austria for their nutrition and onto us. We have added two new videos of them feeding and playing, their personalities beginning to emerge. We already have a ‘howler’ as you will see in video 1 half way through! We un-expectantly have a female pup available from Austria’s litter. If you are interested in this lovely girl then please contact us asap. The pups will go to new homes in mid-December. Austria pups are two weeks old and growing like mad. Weights vary between 1.1kg and 1.5kg. Austria is proving marvellous, cleans them and the pen spotlessly, just reaching the stage now when she needs a bit of a break from them for an hour or so. She is eating for England, currently 3kg a day in raw meat! That is 3 times her usual amount. New video and pictures added to the litter page. Austria’s pups are growing well, all are around 1kg in weight and just over a week old. We have added the first video of them at 1 week old, follow the link to view. For those of you that are members of the Leonberger Club of GB you would have received your ballot papers for the nominations for the various committees for the forthcoming AGM to be held on Sunday 24th November 2013. This is your important chance to vote for those people that you would like to represent the best interests of the Leonberger and we would urge you to exercise your right to vote. For those members that can make it, we look forward to seeing you all there. Austria has given birth to 8 pups, 4 boys and 4 girls! Mum and pups are currently doing fine, all very even weights. Apologies, several people noticed that the artificial grass video was locked out so we have removed the restriction so this can now be viewed. Austria should give birth within the week! Keep eyes peeled for the birth update. Great news, Austria is pregnant! She is expected to give birth to her little beauties around the end of October going to new homes just before Xmas! We have added a few more videos to our videos section. These are some fun videos we took several years ago; our mad dogs playing around on the new artificial grass we had recently laid , and also of them in deep snow, all of endearing Leonbergers having fun! We have successfully mated Austria with Thunder. We shall be scanning Austria in a week’s time to see if she is pregnant. Fingers crossed ! The additions to the website continue; we have now added the In Remembrance section which remembers those wonderful dogs that have graced our lives and are sadly no longer with us. We added some videos to the Videos tab, and will be adding more as time goes by as we look into our archive of videos we have taken of our beauties over the years. Two of the videos are of our new addition, Bronte, one of which shows her playing with our guest puppy, Lola (Korea pup) last week. Endearing to see how Leo girls naturally behave with youngsters. We have a marvellous update on Alfie, the gorgeous boy who the Dog Insurance article was based upon. This does tend to point towards a food related DCM heart problem. Most Leonbergers can produce their own taurine from two other proteins, but this mechanism can break down without any warning and the dog can get DCM. Raw meat alleviates this problem as meat has plenty of taurine; dry kibble food has none unless it states that it has been added as a supplement. We have added the Ben Hope walk photos to the Articles of Interest. During July took Austria & Thunder on a walking trip for 4 days to the Scottish Highlands all the way up to Ben Hope, which is the most northerly latitude munro in Scotland, approximately 100 miles north of Inverness. From our place it took in total 12 hours to cover 450 miles. If you have never travelled to the far north of Scotland you will find some of the ‘A’ roads as nothing more than single tarmac tracks with occasional passing places so you can dodge the oncoming traffic! Stunning scenery though so well worth the effort. The trip was during the heat wave of July so was superb sunshine throughout, although the heat did become oppressive at some points. The obvious bit of news is hopefully you may have noticed the revamped website! The change/update was forced onto us due to software upgrades and incompatibility issues, but now we have revamped it we hope that you like the new look. The old website was getting rather huge (over 450 pages!) so we have slimmed this one down and will keep adding to it over time whilst keeping all the important information from the old site. Articles of Interest now includes the story of Simba Top Dog Model and how he won in October 2012 as well as the links to the videos of his exploits! We have moved raw prey diet feeding information to Leo Information as a permanent feature now. Korea’s pups all went to their new homes a couple of weeks back, another fantastic collection day with over 25 excited people gathered at our place to collect their puppies! We have a new addition, Bronte, who is Cuba’s sister, who came back to us in April. Initially we planned to re-home this beautiful girl, but fell for her numerous charms and monitoring her remarkable acceptance within our pack we have decided to keep her. She loves people, (as all of our visitors in the past 4 months would testify! ), is great with dogs., and has an adorable loving and exuberant character that captured our hearts. Brazil and Cairo enjoying the snow, before the real storm hit. Notice the 6ft brown wood retaining wall in the background that becomes buried the next day. During the storm the snow drift in the drive was getting serious and it was only a kindly Lancashire County Council tractor driver that agreed to clear it of approx. 15-20 tons of drift snow a couple of days later or we would still be cut off! The magnificent late Finland looking as usual like he has just caught a gazelle in the Serengetti !